few days ago ... we had to share it! that, is beyond cute... I want to join the pile! 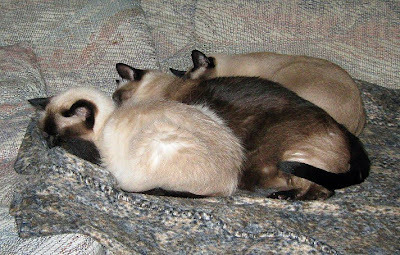 Every kitty should teleport here to join our Meezer Pile ... woo hoo! Have a good Sunday nap. That's a sweet snuggle pile! Happy Sunday! It's a roast beef on light rye Meezer sammich! Wow what a great kitty pile, can I join in too!? There's nothing prettier than a Meezer pile! Wow, not only a kitty pile, but SYNCHRONIZED too! You can click on our pictures to enlarge them if you'd like to, and sometimes they have secret messages if you hover over them! Hi there! We live in Rocky Mount, Missouri, at the Lake of the Ozarks. Thanks for stopping by to visit ... come and join our Meezer Pile! Click on the picture to visit! Max left for the Rainbow Bridge on 5/27/00 ... we love you and miss you so much, Schmills! Sabrina's Sweet And Handsome Boyfriendcat!